Trump’s biggest broken promise to his voters is right there in his new budget. It’s right there in his new budget. Office of Management and Budget Director Mick Mulvaney in the Brady Press Briefing Room at the White House, Tuesday in Washington. As president, he and his allies want to use deep cuts to the program—or rather, Trump is allowing Office of Management and Budget Director Mick Mulvaney and House Speaker Paul Ryan to use them—as an ATM to fuel the rest of the Republican legislative agenda. Medicaid cuts finance the plan to “repeal and replace Obamacare,” i.e. to cut taxes. Now we know, with the release of the White House’s 2018 budget, that the administration aspires to use additional massive Medicaid cuts as its means of bringing the budget closer to balance. Yes, the president’s budget is mostly a symbolic document without the force of law; Congress will write its own budget and pass its own appropriations. But as my colleague Jordan Weissmann wrote, this document is still an important signaling mechanism from the White House to the Republican Congress: Here are the areas you can’t go after, here are the areas you can. The president will not let them touch Medicare or Social Security’s retirement program. But it is open season on Medicaid. Mulvaney’s budget shows that the $840 billion in Medicaid cuts included in the American Health Care Act that the House of Representatives passed earlier this month are intended to be a mere down payment on the long-term pulverization of the program. The bulk of Trumpcare’s upfront Medicaid savings come through a freeze on Obamacare’s expansion of the program and its enhanced federal matching rate for expansion enrollees. In 2020, the program would shift from its current open-ended federal matching structure to one of either per capita caps or blocks grants to the states. The idea is for the federal government—rather than matching what states contribute according to their citizens’ Medicaid needs—to set a certain amount of money it will contribute to state Medicaid programs and grow that amount steadily by an inflation measure. The AHCA uses the medical component of the Consumer Price Index, with higher rates for children or the disabled. Those rates, by design, are lower than the projected growth in Medicaid spending under current law. That gap in growth rates will be the source of compounded, long-term federal savings—or, if you’d prefer, the source of compounded, long-term dumping of costs onto the states. The White House budget, in one of its many tricks, assumes the Medicaid savings that would come through enactment of the AHCA—and then adds another $610 billion in cuts to the program. 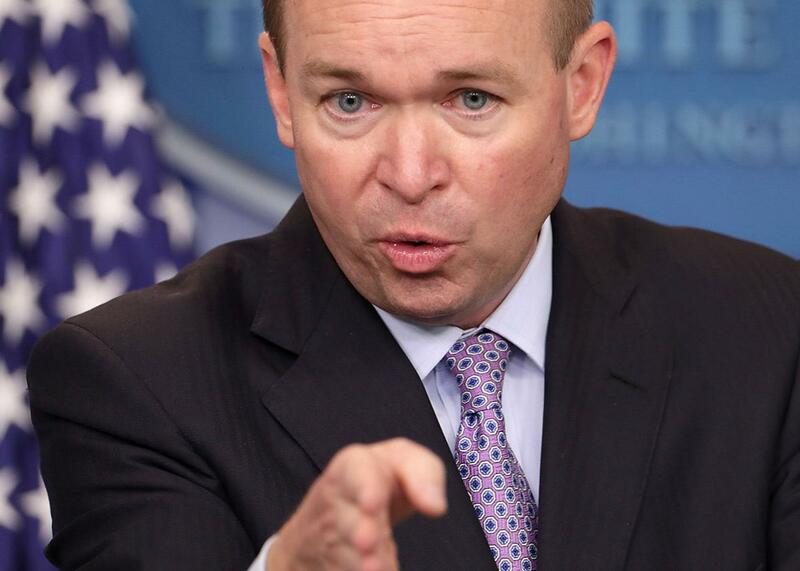 Mulvaney, in a briefing with reporters on Monday, said that the federal government would draw these savings by moving to an even lower inflation index. “We go another half a step further and ratchet down some of the growth rates that are assumed in the AHCA,” Mulvaney said. “So if you assume growth rates—I can’t remember what the exact measure is—it’s a CPI–plus measure. We take a measure that we think is closer to what the actual growth rates look like.” It’s unclear, but he may be talking about straight CPI, the index Ryan’s “A Better Way” agenda used in its vision of Medicaid reform. So before the ink is even dry on a congressional health care bill gutting Medicaid spending, we have the White House proposing additional cuts of hundreds of billions of dollars. These cuts would total nearly $1.5 trillion over 10 years. That’s a lot. This budget serves a useful experiment in where the conservative eye drifts when Social Security retirement benefits and Medicare are declared off-limits: exclusively to programs for poor people, of which Medicaid is the largest. Conservatives don’t intend to use the AHCA as a one-time vehicle for cutting Medicaid. It institutes a new mechanism to draw on that can be “ratchet[ed] down” when needed to finance further tax cuts or Pentagon spending sprees. The AHCA puts a hard squeeze on Medicaid, and this budget holds Medicaid upside-down by its ankles to shake the loose change out of its pockets.